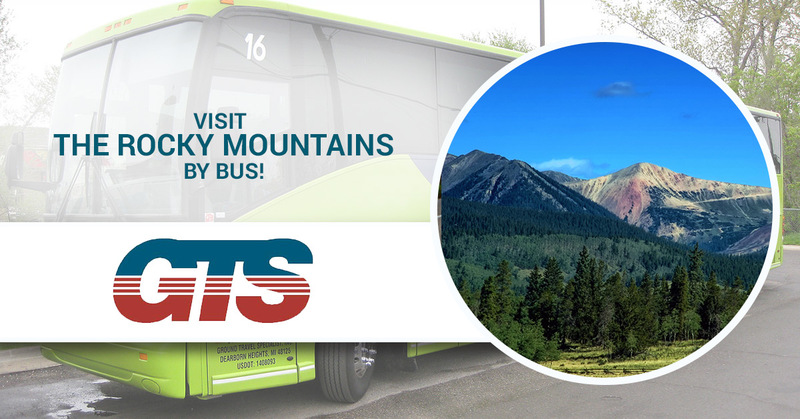 Visit the Rocky Mountains by Bus! There are few locations in the United States more iconic than the Rocky Mountains. They represent one of the many difficulties that explorers faced as they spread out across our country, and they’re also famed for their absolute beauty. Because they are so large (they stretch approximately 3000 miles from Canada, through Montana, Idaho, Wyoming, Colorado, Utah, and into New Mexico) it can be hard to narrow down where you might want to travel to in order to see these majestic mountains. In this blog, we’ll cover the tiniest sampling of some exciting places you can go to see the Rockies. If you’re ready to book a charter bus for your trip to the Rocky Mountains, contact Ground Travel Specialist today! We have a fleet of buses that can carry small or large groups as far as you need to go. Our fleet is expertly maintained and each of our drivers is trained to transport your group safely across the country in any kind of weather. Montana is perhaps most famous for two things: the big sky, and the spectacular fly-fishing. Thanks to books (that later became movies) like A River Runs Through It, fly-fishing in Montana takes on a nearly mythic quality to devotees of the sport. Montana is full of rivers where the fishing can be great and the views are always spectacular. If your local fishing club is looking for a place to spend a few days (or a week), you can’t go wrong with Montana. There are many qualified guides who can bring you to special spots where the trout hit hard and the sky and the mountains will take your breath away. If you’re part of a hiking club or any group that loves to spend time in the outdoors, the Rocky Mountains are full of National Parks. Rocky Mountain Nation Park outside of Estes Park, Colorado is a huge area of wilderness that has trails for hiking, campgrounds, and unbelievable views in every direction. You’re almost guaranteed to see some of the famed elk that roam the park when you visit RMNP. Yellowstone National Park is one of the most famous of all the national parks, and for good reason. It features a huge mixture of topography, flora, and varieties of fauna that we can’t possibly do justice to here. When you go to Yellowstone, you should definitely try to check out one of the many geysers (just don’t get in them), try some whitewater rafting, and look for the Yellowstone Buffalo that roam the park. These buffalo are special because they’re the last remaining natural population of bison in North America. Unfortunately, we don’t have time to cover more of the incredibly exciting things there are to do in the Rocky Mountains, but if you come back soon we might try to devote another entry to this incredible region. While you wait with bated breath, give GTS a call to charter a bus to one of these locations or any of the hundreds of other spots in the Rockies where your group can have some fun!